Congratulations to Dr. Jane Goodall, who was recently appointed Grand Marshal of the 2013 Tournament of Roses. This will be a televised event, and she will be riding on a float for the 124th Rose Parade. She’ll be tossing the coin before the Rose Bowl game begins. Dr. Goodall is an inspiration to the Pasadena Tournament of Roses because they are invested in finding ways to dispose of waste that is more friendly to our environment. Dr. Goodall is the founder of the Jane Goodall Institute, and is involved in protecting the habitats of chimpanzees and saving their lives. For more information on how the Tournament of the Roses is going green, click here. 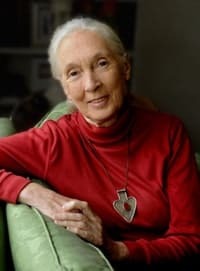 For more information about Dr. Goodall and her organization, click here. See Disneynature’s new film, Chimpanzee, in theatres now! Saturday Featured Blog | Are Butterflies Ticklish? Wow that’s fantastic! Thanks for sharing such cool news with us.